Our Beyond Standard ergonomic design for Tiffany, 18 fully height adjustable workstations, from 22" (for viewing microscopes) to 48" (for stand-up access). Surrounding panels prevent precious jewels from rolling off the worksurface. Details and finishes match surrounding Knoll panels and furniture. We have completed four operations centers for PSE&G in New Jersey. 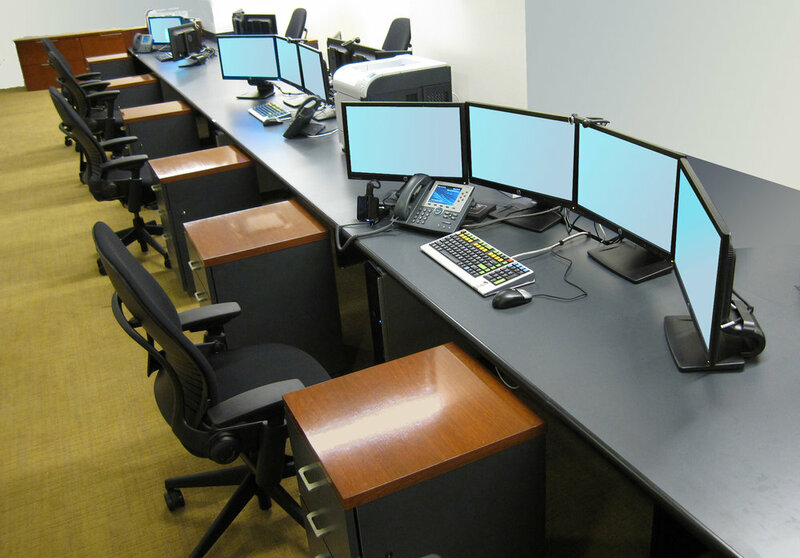 This Command Center for their New Jersey Gas Operations, features ergonomically designed workstations with height adjustable screen arrays. 24/7 schedule allows multiple operators to individually adjust screen heights while maintaining clear line of sight to system schematic at front of room. US Southern Command in Doral Florida required technology-free desktops for unobstructed sight-lines to oversized illuminated wall panels. 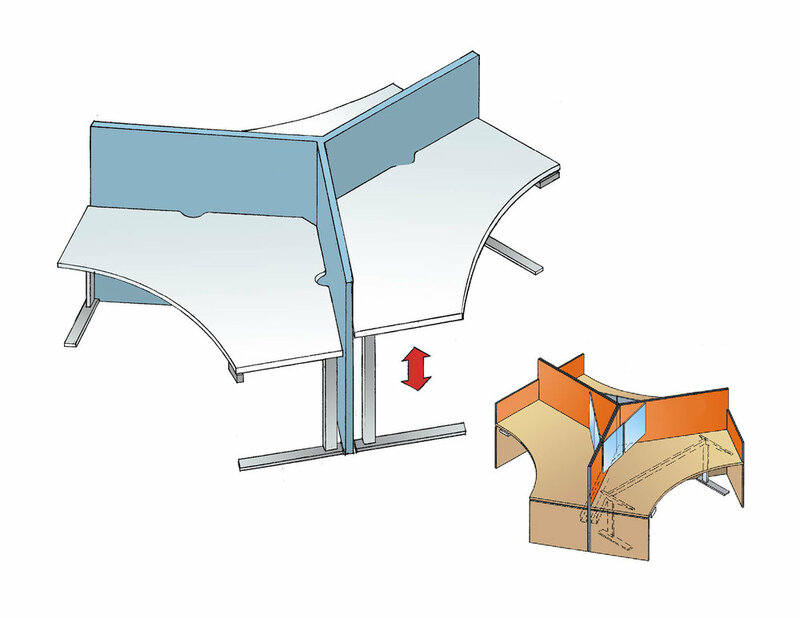 We analyzed viewing angles with detailed ergonomic section views, and mounted computer screens at a pre-calibrated angle below the worksurface. Controlled lighting eliminated overhead overhead glare and reflections. Individually height adjustable Cluster Workstations with acoustic privacy screens, provide defined spaces for collaborative project activity. We have design/manufacturing experience with an extensive range of mechanical drives and cable management. Beyond Standard trading desks for an awkwardly columned space. We created a cohesive system of desks individually sized to maximize and fit the available space. Veneer topped pedestal cabinets added a cherry accent to the laminate desktops. 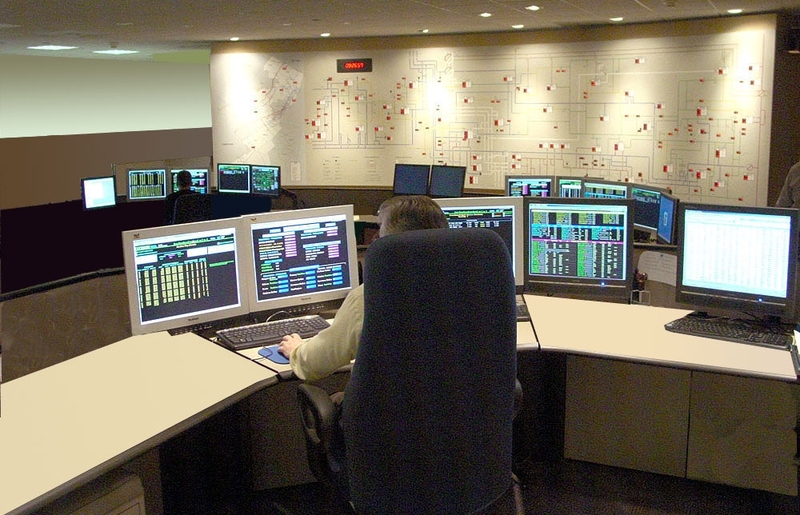 This Command Desk configuration is a 24/7 operation for dispatching critical response teams for PSE&G system outages and grid failures. Absorbent bumper edge protects vulnerable edges from abuse.